One of the easiest ways to nurture your email list is to send a personalized newsletter periodically. Some companies publish such great newsletters that they promote their newsletter as a freebie on their site – a nice way to build their subscriber list. Others automatically put any customer’s email address or address acquired from other sources on the newsletter list (once the individual agrees to subscribe) – a nice way to extend their reach. 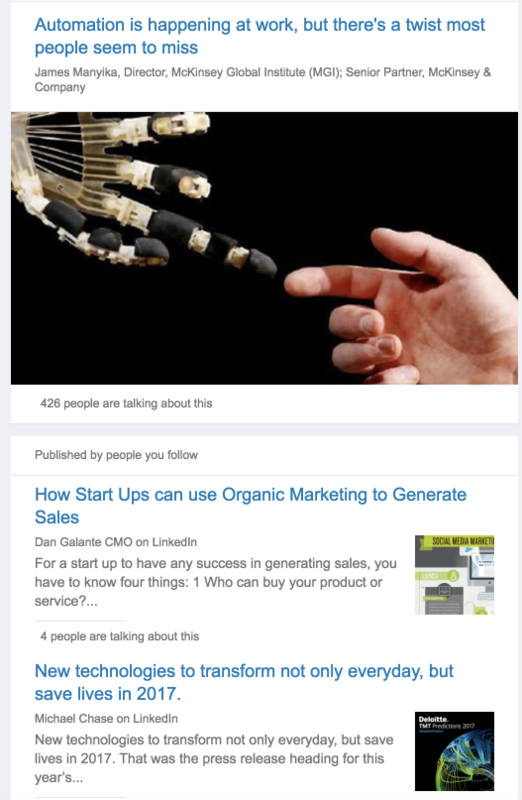 Whatever your strategy for gathering newsletter subscribers, it’s important that you make sure you’re sending personalized newsletters to targeted lists. Without personalization, you run the risk of getting you email dumped in the trash or being marked as spam. Everyone likes to win and everyone likes to get gifts. Reward your email subscribers by framing the email in a way that tells them they are being rewarded for their participation. This could be anything from granting them VIP access to a special event to a special offer or discount coupon for the next purchase. The goal is to personalize it in a way that rewards the email recipient for a recent action they took on the website. It could be set up as a trigger email (outside the regular newsletter) if you are targeting users that all perform the same action. 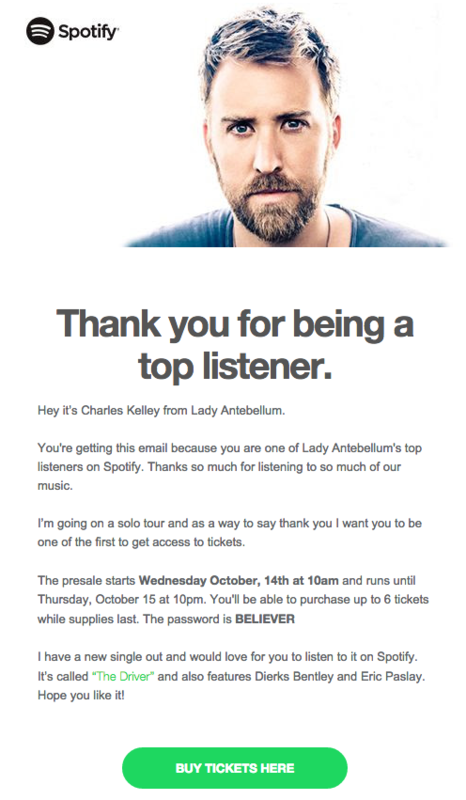 Spotify does a great job with this by saying ‘thanks for being a top listener’ and adding a call to action about pre-sale tickets to an upcoming event. This makes the recipient feel valued which in turn can encourage them to buy something. Since you are likely using analytics to track user behavior on your website, you’ll be able to collect some information about their recent visits, preferences, or even items abandoned in a shopping cart. Using this information to create a custom email that is sent as a follow up to the visit can be a simple but effective way to personalize the newsletter. Incorporate the usual newsletter elements, such as articles and blog posts to keep the recipient informed, but also add an element of personalization by including a screenshot of the shopping cart or a listing of items that the visitor expressed interest in when they last visited the site. Emails with free gifts, a special discount, or other bonuses and offers to celebrate a birthday will usually be well-received — and opened. You might even be able to make a sale by extending an exclusive offer or simply recognizing it’s the recipient’s birthday which will put them in a good mood. Hawaiian Airlines does this with their ‘Happy Birthday’ email to their newsletter subscribers and provides a special promo code with instructions on booking the flight right then and there within the email. This can be a great way to secure a sale without being pushy, especially if you frame it as part of the birthday celebration. You can’t leverage a newsletter if the email recipient doesn’t open the email. Don’t forget to personalize the subject line if the opportunity allows so the recipient is eager to open the email. Don’t just start the subject line with the recipient’s name, instead include something personalized in the title — based on their recent visit or request to receive a newsletter — so that they want to open the email right away. Personalizing emails for all newsletter subscribers could be just what it takes to improve click-through rates and even have those emails opened upon every send. Framing your email newsletters with incentives can help you engage more subscribers and drive more traffic your website, landing page, or a checkout page. It also reduces the risk of having emails labeled as spam or triggering unsubscribes.